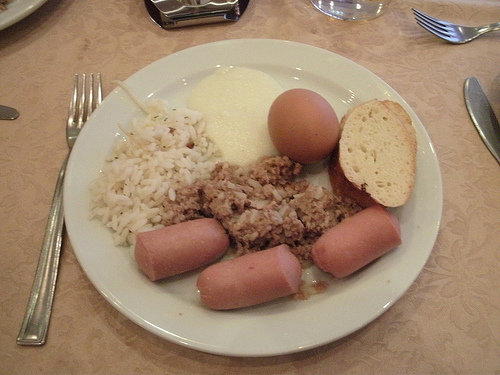 hard-boiled egg. I also had a coffee with milk. There is a TV on in the dining room which has what seems to be a 24-hour news channel tuned on. Father Sergey picked us up and drove us the short distance to the church. We met several people - including Deacon Victor Shtraube (from Chelyabinsk) and his expecting wife! I spoke with a young layman about 25-years old or so. He speaks English though not fluently. His name is Vadim, and he lives in Siberia in the city of Kurgan between Yekaterinburg and Omsk. He's a member of Father Sergey's parish (Sts. Peter and Paul) and has a 6-hour bus commute to attend church on Sunday. His parents are atheists, though his grandmother was Russian Orthodox. He had been baptized in the Russian Orthodox Church, but was never able to understand the liturgy because of the language barrier (Russian Orthodox liturgies are not conducted in Russian, but rather in Old Slavonic). 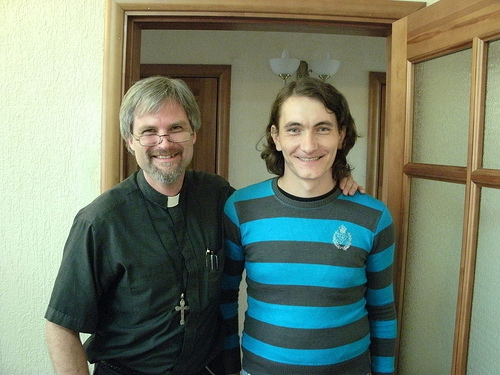 He stumbled upon a children's Bible, and that set him on the course to become a Lutheran. I have a cup of tea. Father Sergey shows up with a half-liter bottle of Mountain Dew for me. My Russian brothers are sensitive to my caffeine addiction, and they genuinely care about my comfort. We have a brief prayer service along the lines of Daily Prayer according to our Lutheran Service Book (LSB) hymnal. Father Sergey is dignified as he leads prayer. I'm seated in one of the small pews next to an older woman wearing a head scarf. I believe my friend Vladimir (see page one of this Siberian Lutheran Mission Society newsletter, "A Lutheran Soul") - who speaks very good French - has arrived. Father Daniel has begun his lecture. We will have two hours each today. After an hour, we take a break. I met Vladimir, and gave him a small gift: a fridge magnet from New Orleans which has some French on it. I explain to him that le français est une langue officielle d'état de la Louisiane, et il y a beaucoup de personnes qui parle français dans notre état (French is an official language of the State of Louisiana, and there are many people who speak French in our state). We chat back and forth in French, as I am certain that I've butched the language. I am, however, amazed at how much I am able to understand as Vladimir speaks, though my own spoken French is terribly rusty. I think being immersed in a non-English environment has stimulated the linguistic part of my brain (then again, maybe it was the Mountain Dew...). Vladimir is quite fluent and enjoys speaking French as much as I enjoy hearing it. In fact, it feels good - liberating, actually, to be able to speak in another lingua franca of the world, to be enjoying conversation with Vladmir in a language that is native to neither one of us, with neither one of us relying on a translator. As we chat, we are speaking with more rapidity. It's a great encouragement to grow in understanding and fluency in multiple languages. After Dan concludes his lecture, we speak to the lady sitting next to me (our translator, as I will learn later, is Evgeny, a young guy who has only been speaking English for about a year and a half). Her grandfather was a Lutheran pastor who was executed by Stalin. He had served in the Volga region. As a young woman, she wished to go to medical school, but was not permitted to study because her grandfather had been condemned as an "enemy of the state." She was mocked as a student because of her Christian faith, which she retained even after all that her family had suffered. I asked her to write her name for me, and she wrote in my little notebook "Альвина" - the letters of which I could not read very well in their cursive form. Father Alexey later rendered this into Latin letters for me as "Alvina." She is more commonly known by the diminutive form "Ала" ("Ala"). 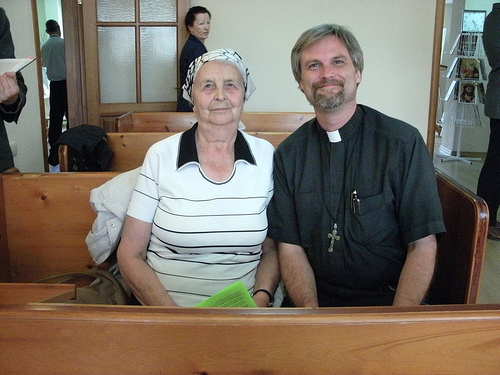 The German form of her name is "Albina" - and although I did not make the connection at the time, the Siberian Lutheran Mission Society had run a fascinating three part article telling Albina's story - which you can read here: Part 1, Part 2, and Part 3. It was a great honor to have my picture taken with Albina. 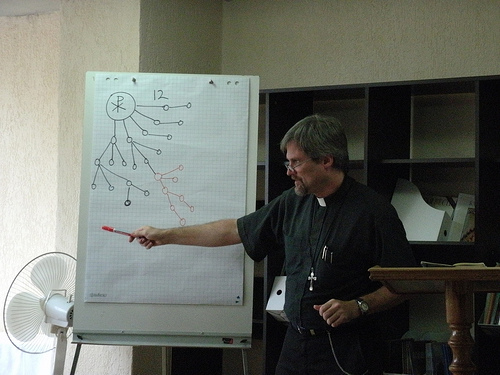 Father Alexey gives his lecture on Romans. We break for lunch, and a large group of us walks over to the Cafe Dadazh (where we went yesterday) - where we have a very typical Russian "business lunch" with a bit of Asian influence, consisting of salad, soup, and a main dish of chicken and rice. We also drink a peach soda - shared by the four of us at our table - served in very small glasses - and we finish with tea. The salad is dry (in a good way). No glop. The soup has some kind of seafood or fish in it. It reminds me of New Orleans. I'm seated with Father Alexey, Vladimir, Vadim, and another young guy named Evgeny (who previously served as my impromptu translator in my chat with Albina). It turns out that he is a 4th year Orthodox seminarian. After lunch, Father Alexey concludes his lecture. I begin my Augsburg Confession lecture at about 4:00 pm and go on until about 6:00 with a break after about an hour. My listeners seem engaged - especially Evgeny. I cover the history part and I get through Article 8. When I field questions, one attendee raised the question of the validity of a baptism conducted by a woman "pastor." I answered that my pastoral practice is to treat such "baptisms" as outside the church. One ELKRAS attendee (ELKRAS is the German missionary denomination in Russia, a more liberal body that "ordains" women), a young pastor named Dennis, became quite agitated. I calmly confessed what I believe and what my pastoral practice is. I was a little concerned, not wanting to offend my hosts, but Father Alexey assured me that my answer is actually the same answer as the position of the SELC. To make things more interesting, we will be traveling to Dennis's congregation to speak to them on Tuesday evening. 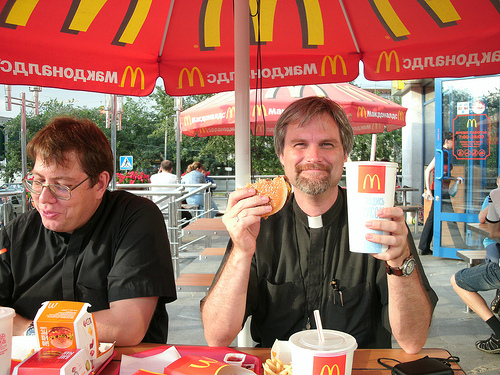 Afterward, Fathers Alexey and Sergey take Dan and me to McDonald's. 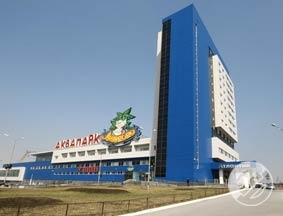 It looks similar to its American cousin, only with Cyrillic letters. Russia has similar language laws as Quebec, and this regulates the amount of English that can be used on signage. I don't know how Traveler's Coffee gets around this. The McDonald's sign looks like this: Макдоналдс - a direct transliteration. I order the equivalent of a Quarter Pounder, known is Russia as a Royal Cheeseburger (Роял Чизбургер). In Russia, you have to pay extra for condiments. Dan and I both order "large" drinks. The clerk says something in response to Father Alexey, who looks at me gravely and says: "Uh, Father Larry, he says that the large drink is a liter." Of course, this is considerably smaller than the large in the U.S. (which explains why Americans are considerably larger than Russians). 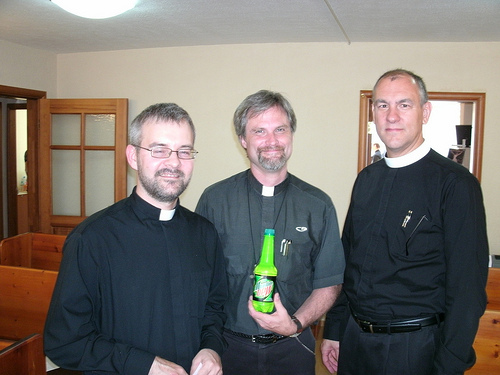 Father Daniel and I, unfazed by the liter, laugh and confirm our order with Alexey. Also, there are no ice in the drinks. I never saw an ice machine in my time in Russia. I also believe one of the staff was scolding me for taking pictures. It is easier to get forgiveness than permission, especially when one is a foreigner. The four of us (Dan, Alexey, Sergey, and I) go outside to eat under one of the red and yellow umbrellas. Next we make an excursion to the "Alcohol Supermarket" subtitled: "Magnum" where Dan shops for cognac - which is of very high quality and considerably cheaper than in the states. He has promised to bring back a bottle for a fellow pastor back home. Afterward, our Russian brothers drop us off back at the hotel. 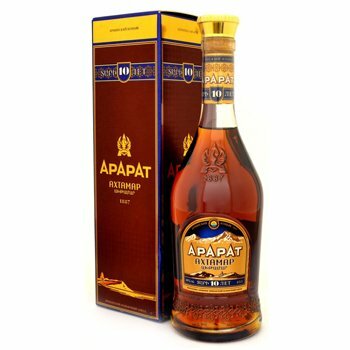 Dan would like to buy another bottle of Armenian cognac (Ararat brand), and I need some batteries. We stroll around, find a supermarket, make ou purchases using a combination of gestures and pidgin Russian. The clerks are helpful and friendly. Dan buys a bottle of Ararat, and I purchase a small bottle of "Мохито" (mojito). Dan forgets to buy himself a beer, and the store has no AA batteries. We see a funny sight: a drunken man carrying a bottle in one hand, and in the other hand he holds a cellphone to his ear. Paying no attention to his surroundings, he crosses the busy highway, chatting and swaying between the zooming cars. It looks staged. The traffic doesn't even slow down. He staggers at a steady pace completely absorbed in his phone call. Somehow, he arrives untouched at the other side without missing a beat, talking in his cell the entire time. We visit a little kiosk where a customer can bring an empty beer bottle and the clerk will fill it with any beer that they have on tap, charging by the amount. It's now well after ten, but the sky is still bright. We stroll back to the hotel. I enjoy an extended chat with Grace and upload pictures. Our room in the Atlantic Hotel has a large and deep bathtub, so I indulge in a steaming hot bath. My knees get sore sometimes, so the soak feels very good. Here is a link to all of my pictures of Day Twenty.